Pisa has the distinction of being known world over for the leaning tower it has. The Leaning Tower of Pisa is one of the 7 wonders of the world. But do you know, there are 9 other leaning towers in Italy? Yes! 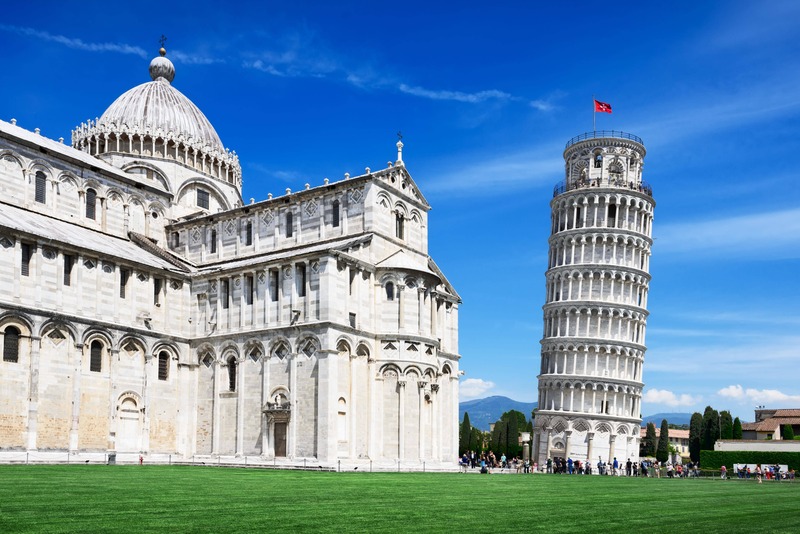 Astonishingly there are 10 leaning towers in the whole of Italy with a majority of them in Venice and Pisa. Let us see one by one all these leaning towers and probably the reason behind their tilt. 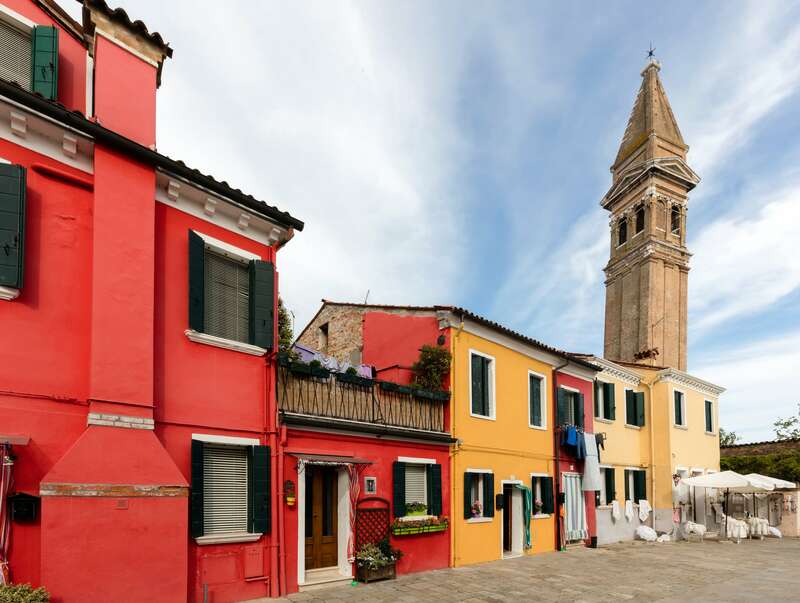 Also known as the Bell Tower of Burano, the Campanile of San Martino is a leaning bell tower in Burano—an island in the Venetian Lagoon. The bell tower stands in the close vicinity to the 16th century St. Martin’s Church. The campanile was built between 1703-1714 by an architect named Andrea Tirali and is 6.2 meters wide and has a height of 53 meters. The bronze angel which once stood on the top of the tower was destroyed by a hurricane in September 1867 and was later replaced by the now standing iron cross. The literal translation of San Giorgio dei Greci is ‘Saint George of the Greeks’ and this tells a lot about the Greek connection of Venice. The bell tower is a part of the Church of Saint George of the Greeks which is a symbol of the Confraternity of the Greeks in Venice. For a long time Greek Orthodox rites were not permitted in Venice but in 1498 the Greek community finally got the rights to establish a confraternity known as ‘Scuola de San Nicolo dei Greci’. 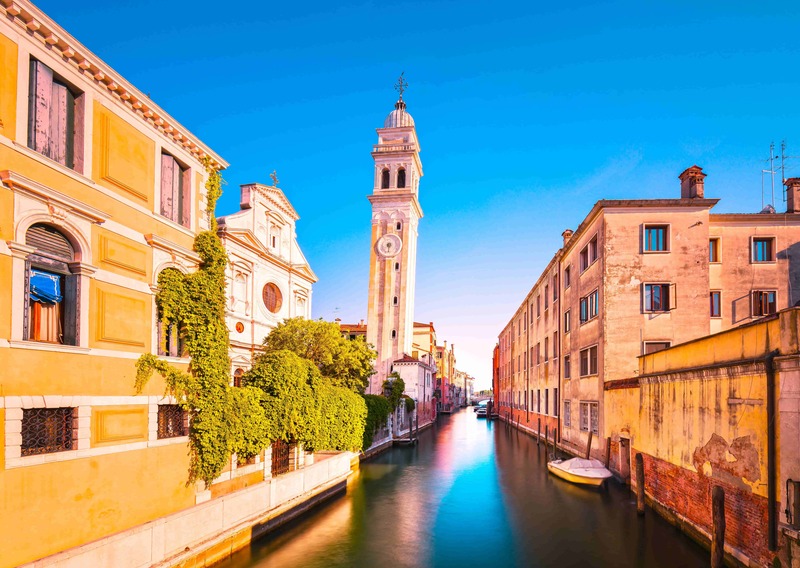 After almost 40 years, in the year 1539, the Greek confraternity was allowed to build a church which was known as the Church of San Giorgio (St. George). However, the construction of the bell tower didn’t begin before 1592. 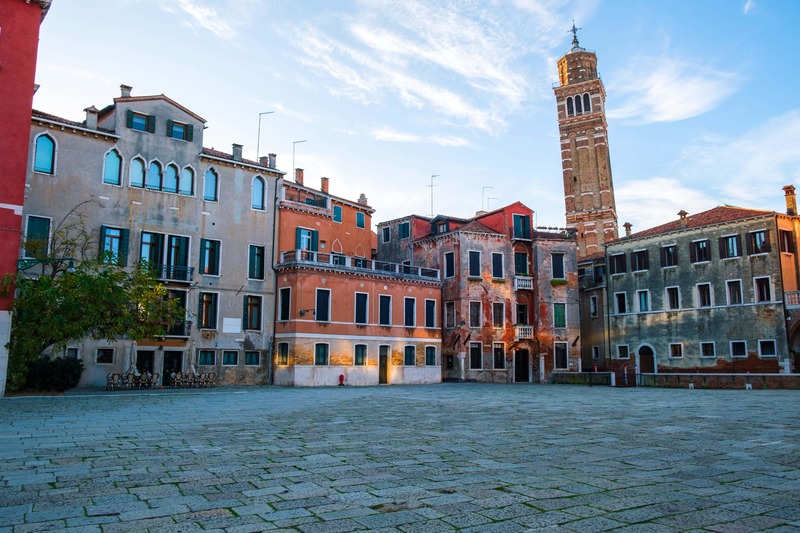 The leaning bell tower of Santo Stefano from 1544 is one of the highest bell towers of Venice, which stands 66 meters high and has an inclination of 2 meters. The tower is located in the neighborhood of San Marco and still has the late renaissance electromagnetic bells. It has been rebuilt and refurbished a couple of times. In the August of 1585, a lightning struck it down melting its bells, later the bells came from England. In the early 20th century the bell tower was once again damaged in an earthquake of 1902 and this time it was the base which resulted in consequent inclination. 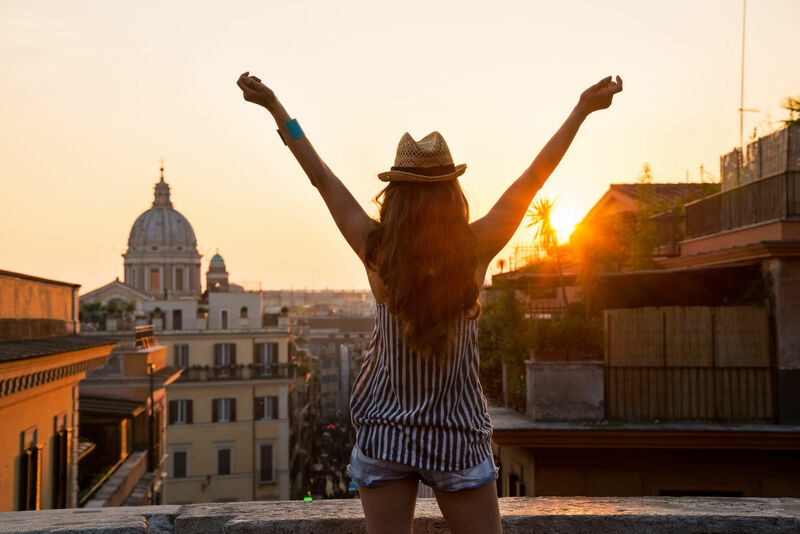 About 150 KMs coming south from the coastal city of Venice is the metropolitan city of Bologna which is the capital of the Emilia-Romagna region of Italy. Bologna is popular for its traditional cuisine and ancient architecture. The towers of the Bologna are the living evidence of the latter. 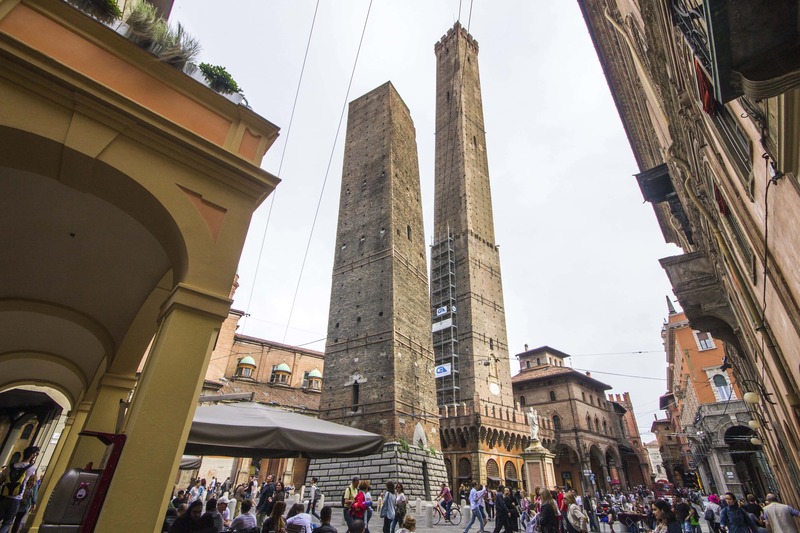 The 2 towers are Asinelli and Garisenda and they reflect the architecture of medieval Bologna. Asinelli was built in from 1109-1119 by the Asinelli family. The tower is 97 meters high and an inclination of more than 2 meters and a staircase with around 500 steps was completed in 1684. Currently, the Commune of Bologna has undertaken the refurbishment of the tower. 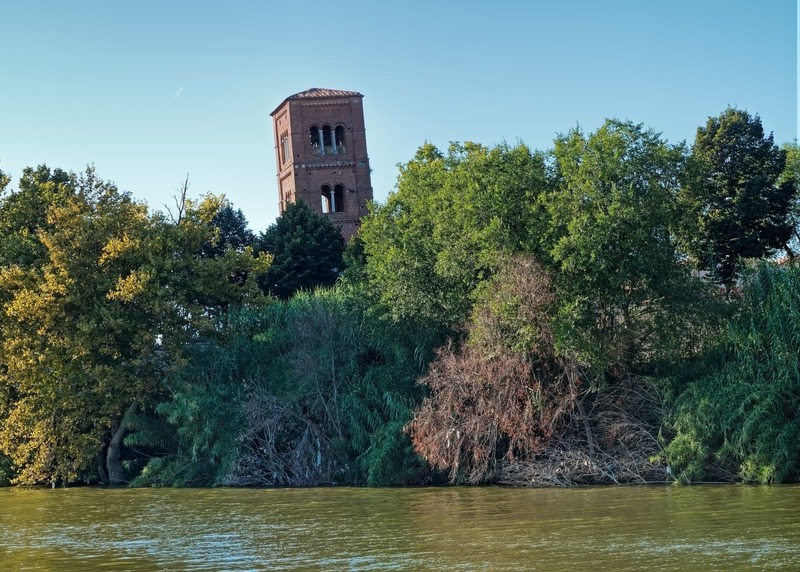 The adjacent smaller tower is Garisenda, which is almost half of Asinelli and stands high at 47 meters. Although smaller, Garisenda inclines more than Asinelli at more than 3 meters. In the 14th century due to the instability of the structure due to a loose foundation, the tower had to be lowered to its present height. 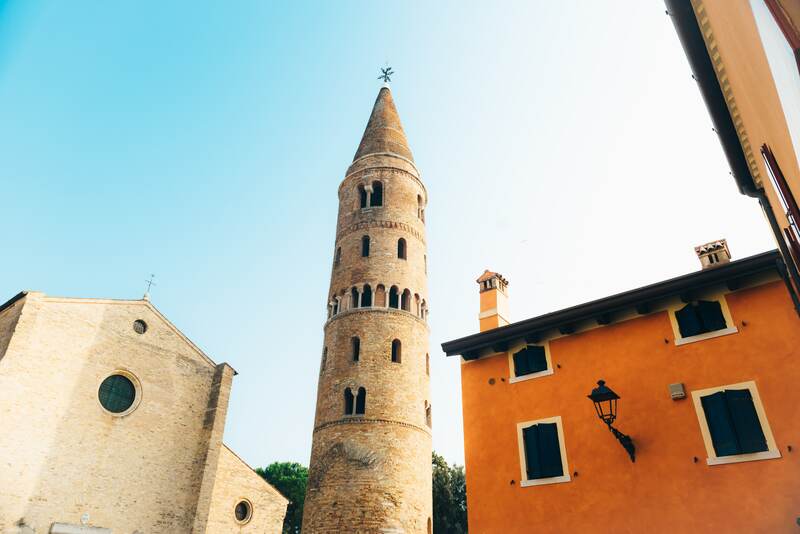 75 KMs from Venice is the town of Caorle which houses one of the oldest leaning towers of Italy. Known as the campanile of the Duomo di Santo Stefano, the leaning bell tower was completed in 1070 A.D. and is 42 meters high. The tower is cylindrical in shape which is its biggest uniqueness (probably one of the only two cylindrical towers of Italy) with a conical cusp. The campanile is divided into 8 floors and each floor has a concrete base except the second floor which has a wooden floor. In 2011 a spiral staircase was installed in the bell tower from the first to the sixth floor, public entrance is closed beyond the 6th floor which leads to the bell cell which is the 7th floor. The bells were removed as a result of the electrification of the bells in the 1970’s. In all Campanile of the Duomo di Santo Stefano is an architectural marvel and a great place to revisit history. The literal translation of Torre Delle Milizie is ‘Tower of the Militia’, also known as Nero’s Tower. 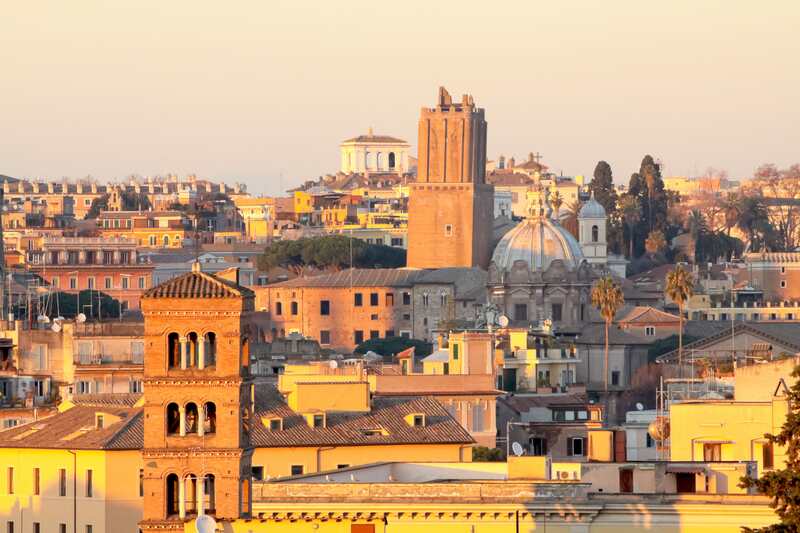 Located in Rome, between Imperial Fora and Trajan’s Market the tower stands at 51 meters high. The meaning of the name of the tower is quite interesting and makes us wonder if there is an equally interesting story behind it. Well, the other name- Nero’s Tower does has a legend but unfortunately, the Tower of Militia is based on just a hypothesis of a garrison in the vicinity at some point in time. The tower was built in the 13th century by an architect named Marchionne Aretino for the purpose of military fortification. Aretino built the tower for the Conti family and was later sold to Pope Bonifacio VIII. The legend has that Nero chose the tower to see the burning of Rome in 64 A.D. The legend as the timeline tells, is terribly flawed, yet is very popular among people. The earthquake in 1348 damaged the tower to a great extent and after that, it started to tilt. It is also said believed that the further inclination happened due to the construction of Imperial Fora. Coming to the city of the most well-known leaning tower- Pisa, there are 2 other towers apart from the leaning tower of Pisa. One of the two towers is the Campanile of San Nicola which is considered to be the second most famous in the city of Pisa, of course after the leaning tower. The tower is supposed to be built in the year 1170 which is based on hypothesis and is believed to be built by an architect named Diotisalvi. There were different stones that were used in the construction like- Limestone, Apuna marble, Elba granite to get a polychromatic effect. The octagonal belfry of the tower is a marvelous wonder of medieval architecture. Along the Arno river in Le Piagge Pisa stands the Church of San Michele degli Scalzi. A bell tower called the campanile of San Michele degli Scalzi is annexed to the right side of the church that stands on a quadrangular and has a 5% gradient. The tilt of the tower is due to caving in of the ground on which it stands. The subsistence in the ground is due to floods in Arno. In fact, the ‘Piagge’ translates to ‘plagae’ in Latin which in turn in English means- low plains, highly prone to flooding. The church was heavily destroyed much recently in WWII by the bombings but the bell tower miraculously survived. The church was later restored and the bell tower has a writing as a proof of restoration of the church and 3 bells which date back to 1851. Finally, coming to one of the 7 wonders of the world- The Leaning Tower or simply known as Tower of Pisa is a marvel. The tower is a freestanding structure which unlike its contemporaries is not annexed to other buildings. The fact that it is freestanding with the clear background makes the tilt stand out, thus one can have a real perspective of the inclination. The tower is about 55 meters high and started to tilt while it was being constructed. The ‘leaning’ was due to the weak and unstable ground beneath it went on the tilt further as it was being subsequently constructed. Although the bell tower was stabilized by the efforts put in the last 2 centuries yet it has earned the distinction of being the world’s most lopsided building for once. Next time you visit Italy, make sure you not only visit the Tower of Pisa but all the leaning towers of Italy.